Denton Poets' Assembly April 20 meeting will begin promptly at 10 a.m. at the Emily Fowler Public Library in Denton, Texas. DPA business activities during National Poetry Month will center on finalizing Merging Visions XI with the Merging Visions Collections XI publication going to print the week of April 15th . Kudos to Rebecca Hines for keeping this project on tract, coordinating collection of exhibition statements and biographies from participating poets. Member response poems will be centered on the poetry of Edward Hirsch and an essay by the poet. Susan Maxwell Campbell’s presentation will focus on the works of Edward Hirsch. After her presentation Susan will distribute a list of quotations by famous poets and ask DPA members to express Agree/Disagree opinions. Patrick Lee Marshall, DPA Secretary, will serve as our Spotlight Poet. After the Spotlight poetry readings, members and guests will read free choice poems. The Fort Worth Poetry Society announced that Mr. Robert Schinzel DPA member, won First Prize in the Society's 2019 William D. Barney Memorial Chapbook Contest. His winning entry was entitled "Westbound 380." Christine Irving, DPA Treasurer, placed 3rd in the William D. Barney Contest. A critique session will be available following the meeting for those wishing to participate in the critique. ​Thursday April 18th , 6:30 - 8:30 p.m.
​Patterson-Appleton Art Center in Denton. 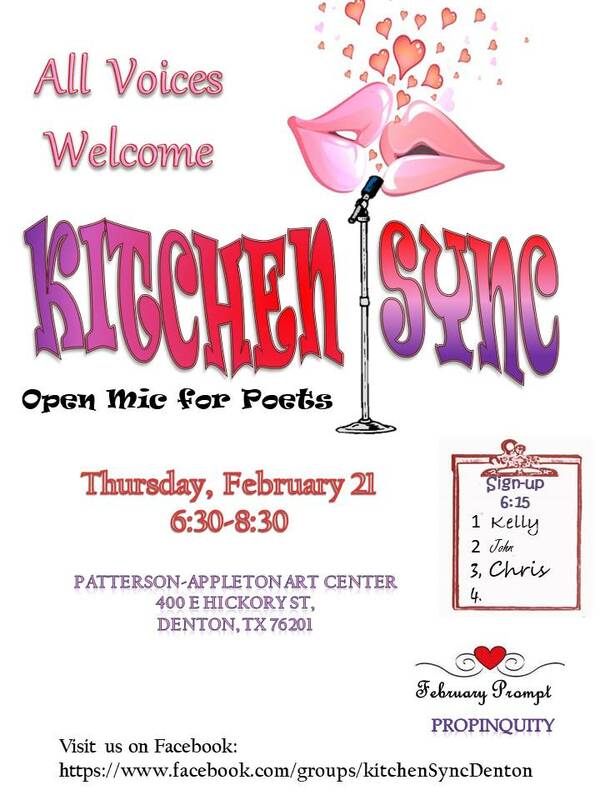 Kitchen Sync is an open mic for poets, sponsored by GDAC and taking place on the third Thursday of each month at the Patterson-Appleton Art Center in Denton. Each month we offer a prompt to prime our poetic pumps. The Fool speaks aloud hard truths that might cause trouble if anyone else told them. She gets away with veracity because s is perceived as being foolish and therefore harmless. We listen when she speaks openly of situations we prefer to deny, because she is entertaining in her difference. Besides she is a misfit and cannot be held fully responsible. The fool plays and everybody believes that play is not serious; she can address the difficult, controversial issues in play all around them. No one is more subversive than the Fool. The Fool’s way of teaching, sometimes known as “crazy wisdom,” runs counter to a culture’s mores, morals, and ideals. By turning society’s expectations upside down he brings the reality of what is, into clearer focus. He speaks in parables and paradoxes, we struggle to understand. But, sooner or later we experience an epiphany and when the dust clears we find ourselves wiser. Denton Poets' Assembly will hold our next monthly meeting Saturday, March 16 at the Emily Fowler Public Library in Denton, Texas. Our meeting begins at 10 a.m. with a welcome to visitors, and a short discussion of new and old business. Denton Poets' Assembly is hosting the Poetry Society of Texas Summer Conference in July. To make reservations, see the form under the Summer Conference menu. To become a sponsor of Merging Visions and receive recognition and a copy of the next edition of Merging Visions Collections see the Merging Visions menu. Members will read ‘Response’ poems to Elizabeth Bishop's poetry right after our discussion. Susan Maxwell Campbell has planned a session designed to encourage creativity. ​Following the Read & Respond session members will take a short break. Next, we will feature Bob Schinzel as our Spotlight Poet. Following the spotlight poetry reading, members and guests will be given an opportunity to read free choice poems. The meeting will adjourn at noon. Denton Poets' Assembly will meet on Saturday, February 16 at the Emily Fowler Public Library in Denton, Texas. Our meeting begins at 10 a.m. with a welcome to visitors, and a short business meeting discussing planned activities plus new and old business. The DPA the spotlight poet reading will be presented by Rebecca Hines. Members will read poetry responses to Read and Respond poems and an essay by Ellen Bryant Voit. Susan Maxwell-Campbell Will facilitate the readings and share additional notes about the poetry. Following the Read & Respond assigned readings, members and guests will read a free choice poem. Read & Respond materials were distributed earlier for the DPA March 2019 meeting for poets ELIZABETH BISHOP and an Ellen Bryant Voigt essay on Bishop. We adjourned the meeting at noon. ​Thursday February 21, 6:30 - 8:30 p.m.
at the Patterson-Appleton Art Center in Denton. Each month we offer a prompt to prime our poetic pumps. This February, in a month devoted to honoring romantic entanglements, we offer PROPINQUITY. Propinquity can mean physical proximity, a kinship between people, or a similarity in nature between things. The effect of propinquity is profound – office romances are a perfect example of how propinquity affects someone’s psyche and body. Never underestimate the intimacy of propinquity, which sneaks in so unobtrusively we barely, rarely sense it happening. This month we ask you to describe an incidence of propinquity. By all means slip the word ‘propinquity’ into your poem, if you can. It’s a big word, an awkward word, a word most of us don’t know, but which affects us all. Witness the homage we pay to propinquity this month as we send our valentines hither and thither in a strange flurry of affection to lovers, friends and strangers. Denton Poets' Assembly will meet on Saturday, December 19th at the Emily Fowler Public Library in Denton, Texas. Visitors and guests are always welcome. We start our meeting at 10 a.m. by welcoming visitors. Next, is a short business meeting addressing old and new business. Board members have decided to introduce a new spotlight poetry reading, allocating 10 minutes to the poet. The board asked Richard Weatherly to be the first spotlight poet. Next, members will share Love Poems in response to J. Paul Holcomb’s lesson in December. DPA members will read poetry responses to a Read and Respond series introduced by Susan Maxwell-Campbell with a focus on Tony Hoagland. The Read and Respond series is based on guidelines frequently used in academic circles. During the meeting Susan will facilitate a look at a Hoagland essay's main points and then elaborate on attitudes related to sentimentality— its rise to prominence in our time and what balances this emphasis. Following the Read & Respond assigned readings, members and guests will read free choice poems. A critique session or workshop will follow the regular meeting. This innovative collection includes poems, notes, short prose (preface and backmatter are essential to the whole), allusions to paintings, and texts. The sum is a cartographer’s manual to the 21st century. Pieces calibrate backroads of Texas, their trajectory, with stopover points at the New Bedford Whaling Museum to see exhibits of the Pequod (or did Melville mean Pequot?) and the Middle Eastern country of Jordan. Christopher Columbus’s ship is a moving point/target. Synesthesia is a signature technique in The Keyboard Letters, as one sense suggests another. In the preface, the author writes, “Poetry after all is a vehicle after a whale” (iii). “Vehicle” deconstructs into a vague mode of mental transport. Yet in common usage it is a motorized conveyance for land use. The metaphor “vehicle” suggests the movement of the imagination across oceans and geographies. This is a book to read, and reread, as an ars poetica. Underlying the European, Middle Eastern, and North American cultural references is an understanding of the unadorned facts of what survives in this apocalyptic, for Native peoples, existence. Transmotion is a biannual, fully and permanently open-access journal that publishes new scholarship focused on theoretical, experimental, postmodernist, and avant-garde writing produced by Native American and First Nations authors, as well as book reviews on relevant work in Indigenous Studies, and new creative work that seeks to push boundaries. During our January 19th meeting members will proof Merging Visions entries submitted for MV2019. Following the Merging Visions 2018, exhibition at the MCL Grand's Art Gallery and Recital Hall, paired poems and art were moved to Denton Branch Libraries. The exhibition continued through Friday, January 18, 2019. ​Greetings fellow poets. Good news! 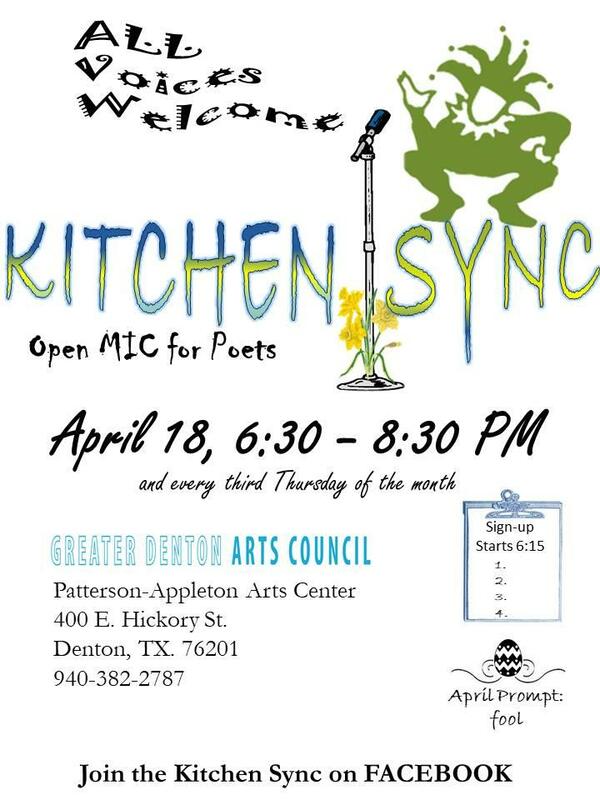 GDAC (Greater Denton Arts Council) will be sponsoring Kitchen Sync on the third Thursday of every month at the PAC in the Festival Hall from 6:30 to 8:30. Our first meeting is January 17th. We are adding a small twist this year. We’ll be announcing a prompt at the beginning of each evening. Poets wishing to participate may bring a poem to the following meeting, containing the given word in any configuration (adjective, noun, participle, present past, etc.). Thematic poems go first in the following meeting. Poets read in order according to sign-up sheet. Otherwise, format is the same – sign-up starts at 6:15. Each poet gets to read one poem. of reasonable length. at a time, taking turns according to their place on the sheet. The prompt for January is ‘two-faced’. I chose it because January is named after Janus the god of beginnings, gates, transitions, time, duality, doorways, passages, and endings. He is depicted as a pillar topped by two heads or one head with two faces staring in opposite directions because every path has two directions. It’s a slippery sort of word , rather like our January weather. Have fun with it. 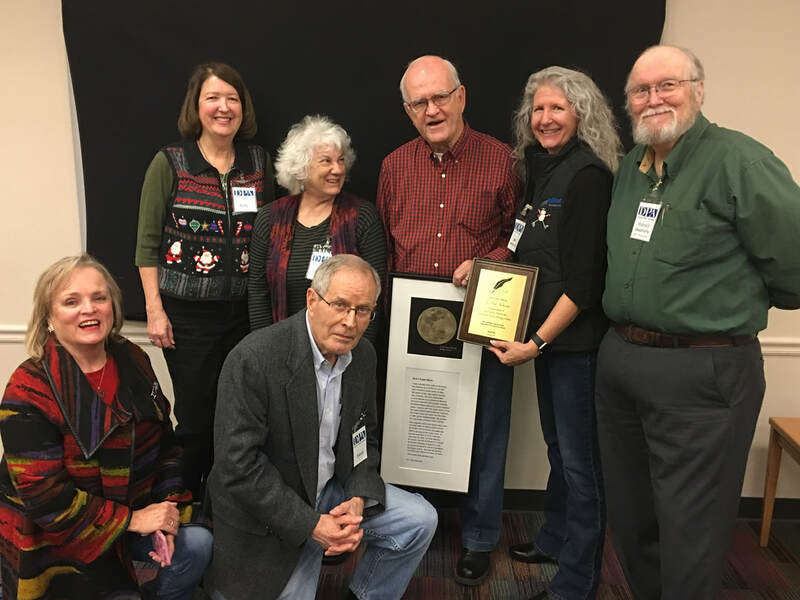 On Saturday January 15th members of the Denton Poets' Assembly came to gather to recognize J. Paul Holcomb for his years service to our chapter through monthly lessons on poetry, especially poetry forms. J. Paul concluded by speaking on “A Matter of Form” and gave a lesson on writing a “Love Poem.” In addition, he shared his thoughts on his time with DPA. J. Paul is stepping down as our monthly presenter of lessons, but we hope to keep him around as an asset and resource. 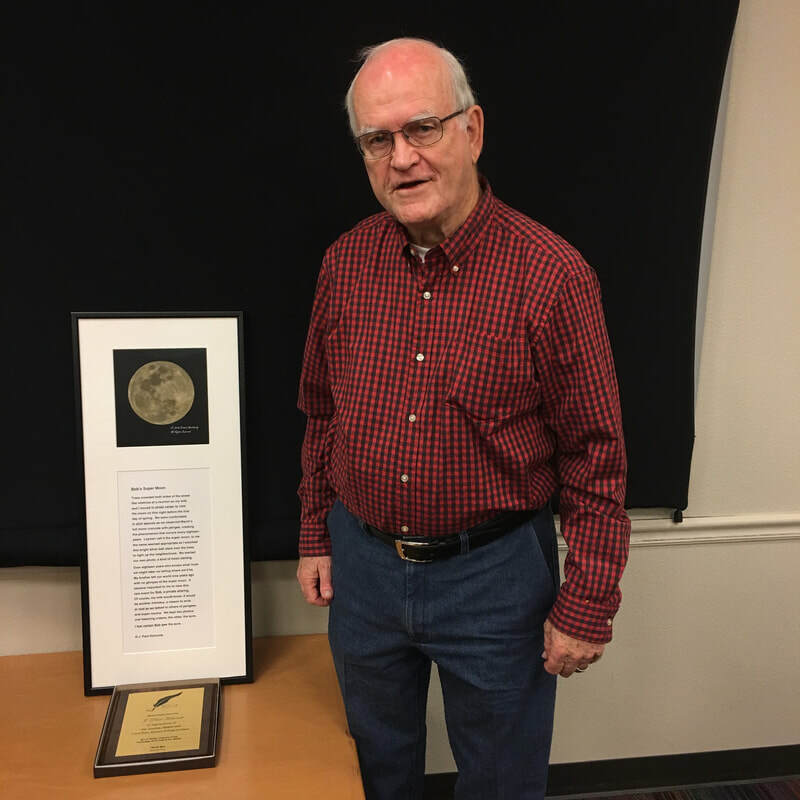 Top Photo - J. Paul Holcomb with framed copy of his Supermoon poem and photo of a Supermoon in tribute to his brother. Bottom Photo- first row Cindy Wood past president and Patrick Marshall current DPA Secretary. Top Row Betty Roberts DPA VP, Christine Irving DPA Treasurer, J. Paul Holcomb, Beth Honeycutt DPA Sr. Board Member and Rich Weatherly DPA President. Denton Poets' Assembly will meet on Saturday, December 15 at the Emily Fowler Public Library in Denton, Texas. Visitors and guests are welcome. J. Paul plans to present his quick lesson on, a "Love Poem." In addition he plans a presentation on, "A Matter of Form." Following the assignment readings DPA plans to engage in a special time, honoring J. Paul Holcomb for his years of service to the chapter his sharing of monthly lessons of poetry, especially poetry forms. He is stepping down as our monthly presenter of lessons, but we hope to keep him around as an asset and resource. Merging Visions 2018, following the exhibition at the MCL Grand's Art Gallery and Recital Hall paired poems and art were moved to Denton Branch Libraries. The paired works can be seen during regular library hours. Take your friends and family to revisit many of the pieces and pairings from this beautiful exhibit. The last day of the extended exhibit will be Friday, January 18, 2019.